Anthony's Paper Craft has some fabulous new stamps coming out in a February Release and this week, several members of the Design Team will be sharing a few with you. I'm excited to see what Michael, Mary and Mike create and will add links to them at the end of this post. I actually chose this stamp because it reminded me of a song I heard on the TV show THE WALKING DEAD. 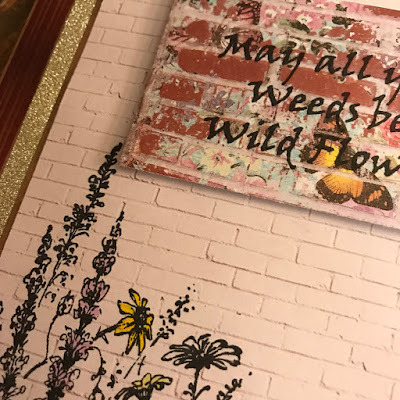 Weeds or Wildflowers by Parsonfields is the first thought I had when I saw thie sentiment with this new stamp and I just had to use it for this Hop. I started with a 5x7 kraft card base for this card. Tim Holtz washi tape was placed down the Left side of the card base- a strip of dark red striped and a thin strip pf gold glitter tape. I stamped the flower image of the FLORAL BACKGROUND 3 stamp onto a piece of cream-colored brick patterned paper ( found at Hobby Lobby in a single sheet ). The sentiment was stamped onto a piece of floral brick paper, using a piece from the Country Road Paper Pack ( also found at Hobby Lobby ) . Both were stamped with a Versafine Clair "Nocturne" ink pad . I colored in some of the floral image with a variety of Tombow Dual Brush Pens . I loved the contrast of the crisp black ink on the brick wall and didn't want to color too much of the design or make it too bright. I used colors that matched the brick pattern that the sentiment was stamped on. The sentiment was trimmed to fit in the space above the floral image and popped up using foam circles. This Floral image is just one of many new releases that will be available from Anthony's Paper Craft in February. I hope that you like my sneak peek and that you will also go and look at those done by my teammates at the links below. I am sure you will be inspired !! I hope that you enjoyed my card using an upcoming release by Anthony's Paper Craft . I will let everyone know when the stamps are available for purchase. I'm sure we will be posting more samples throughout January so be sure to follow Anthony's Paper Craft on Facebook. Thank you again for visiting Meticulosity. I love this card. And have several stamps in my cart on Anthony's site.